I have been in the wild web world longer than many of you who are reading this. I’m a Gen X, not a Millennial. Most likely, the biggest differentiating factor between me and a Millennial who is doing the same type of web marketing work as I currently am, is that I worked in an office. Sure, sure, you’re saying that so have you. But my first job was in a serious mega corporation that wasn’t full of young people aspiring to hit it big with IPOs and stock options. My employer was already on the stock market and I had the bigwigs from New York breathing down my neck for sales revenue reports, forecasts, and whatever else they needed. This also happened to be my first job out of college. I was young, but eager to be a team player, and a fast learner. What I learned in those 3 years of corporate life was something I have taken with me to every job since. Old school office etiquette works wonders. Even in this current fast-paced web world. I’ve been working at home for more than a decade, but I never let my etiquette slip. 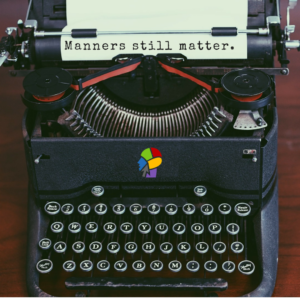 Since my clients, and Web Marketing Therapy coworkers are all over the U.S., all of my work and most of my correspondence is done electronically so my office manners have been transposed a bit to fit the web world, but the gist is still the same. Keep your emails clear, polite, to the point, and prompt. If there is something you need, be clear to ask for it…nicely! Emails should not be one word or in all lowercase. I don’t care if you reply from your phone! You don’t talk in one word sentences (and even if you do), your emails should not just be one word sentences. Confirm receipt of work emails from clients, even if you haven’t completed it. Occasionally something doesn’t get delivered and if your client is used to a confirmation, than they’ll know if you haven’t received their email. Use “please” and “thank you” whenever necessary. Your email subject needs to reflect what your email is about. Don’t forward anything personal (jokes, political statements, funny cartoons, chain letters, etc.,) to clients, even if you are on “friendly” terms. Stick to a basic font (Arial, Helvetica), in a “regular” size, and use black. Do not use ALL CAPS, EVER. No profanity belongs in any client email. Temper the exclamation points, the bolded words, and underlining. Avoid shortcuts for words: “u” for “you”, “bc” for “because”, “gr8” for “great” and so forth. If there are multiple people on a message you receive, decipher whether it is appropriate to “reply all” or to just reply to the sender. Keep your client or coworkers in the loop. You may be half way through a project, but it’s always nice to send them a brief status email update so they know that you are working on it. Sign off your emails with a pleasantry such as “Sincerely”, “Warm Regards”, “Kind Regards” and include a signature with your contact information. Notify clients and coworkers of vacations or times when you are away from your office. Use your out-of-office assistant when taking extended time away from work. Whether you are Gen X or a Millennial, don’t be afraid to throw in some old school office etiquette in the new wild web world. After all, courtesy, respect, and professionalism never go out of style.